These models use the Fabber Bayesian model fitting framework  to implement a number of models for Dynamic Contrast Enhanced MRI (DCE-MRI). The DCE models are not currently included as part of FSL. To get the models you will either need to build from source using an existing FSL 6.0.1 or later installation, or download the pre-built Fabber bundle which contains the latest DCE release alongside other models in a standalone package. --infer-kep Infer Kep instead of Ve - the two are related by Kep = Ktrans / Ve. Often inferring Kep enables a better fit to be found however the resulting derived values of Ve may be greater than 100%. This may reflect an innaccurate T10 value. --fa Flip angle in degrees. --tr Repetition time (TR) In seconds. --r1 Relaxivity of contrast agent, In s^-1 mM^-1. The following model parameters can be specified as options, however they can also be inferred as part of the fitting process. If they are inferred the specified value is used as an initial value and also as the prior value. --t10 Baseline T1 value in seconds. May be inferred. --sig0 Fully relaxed baseline signal. May be inferred. --delay Injection time (or delay time when using measured AIF) in minutes. May be inferred. It is quite common to measure a T10 map independently (e.g. using VFA images or a saturation recovery sequence). In this case you can use --infer-t10 and add an image prior for the T10 value. See the examples below for how to do this. The arterial input function (AIF) is a critical piece of information used in performing blood-borne tracer modelling, as in DCE and other types of MRI. The AIF can either be specified as a series of values in a text file or a generic ‘population’ AIF can be used. If the AIF is suppplied as a signal-curve --aif=signal it will be converted to a concentration-time curve using the supplied haematocrit and T1b values --aif-hct and --aif-t1b. If using the Orton AIF  the parameters may be varied using the options described below. The defaults are those given in the Orton paper. The Parker AIF  uses hardcoded parameter values from the paper. 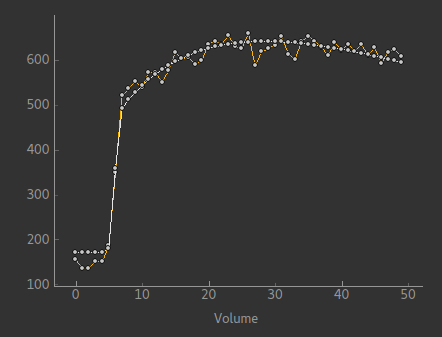 Automatically initialize posterior value of delay parameter by fitting a step function to the DCE timeseries. © Copyright 2018, Martin Craig Revision f6aabba1.